CANNABIS CULTURE – Cannabis Culture News LIVE will not be seen this Friday – but tune in SUNDAY, FEBRUARY 20 at 1PM – 4:20PM to watch Hempology 101’s LIVE feed of The 12th Annual Cannabis Convention at the University of Victoria. 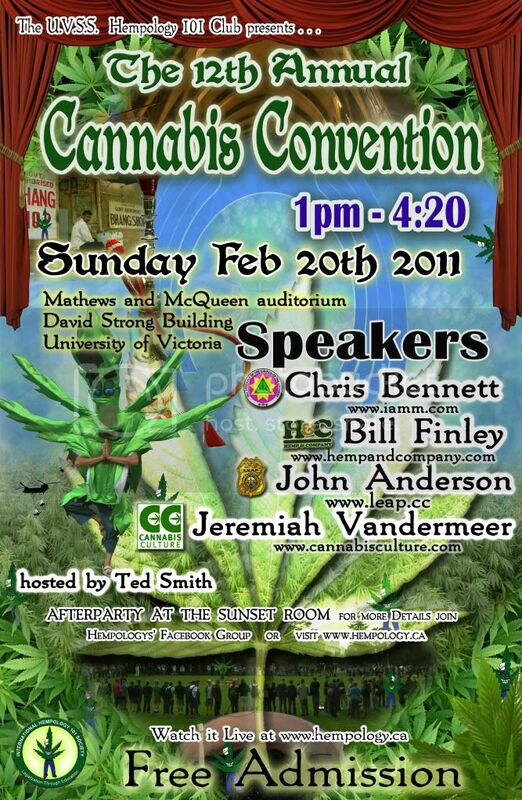 As part of the International Medical Marijuana Week in Victoria, B.C., The Cannabis Convention at UVic will feature speakers including cannabis historian Chris Bennett, Bill Finley of Hemp and Company, CC Editor Jeremiah Vandermeer (host of CCN), Professor John Anderson of Law Enforcement Against Prohibition and a special appearance by Princess of Pot (and CCHQ Executive director) Jodie Emery. Click here for more information about The 12th Annual Cannabis Convention. Visit the Hempology 101 website.